On this feast of St. John Mary Vianney, 16 priests of the SSPX are celebrating notable priestly anniversaries in 2017, listed to the right. The US District had an opportunity to talk with two of these priests on their experiences serving as a priest in the Society: Fr. Frank Kurtz, celebrating 20 years, and Fr. Trevor Burfitt, celebrating 15 years. We request your prayerful generosity in a spiritual bouquet (below) we will present to our faithful priests, and direct your attention as well to our ongoing prayer crusade for priests. Could you tell us one of the events causing you to choose to enter the seminary? I went to public schools and was a protestant until the 4th grade. That year (1980) my parents enrolled my brothers and I in Catholic (Novus Ordo) school because they knew we would get a better education. As it happened, this was a very conservative Catholic school and parish. The priest was around 80 years old and had been at the parish since World War II. He wore a cassock, the sisters wore habits, everyone knelt at the communion rail and received communion in the traditional matter. We were taught Baltimore Catechism and sung some Latin. This was my introduction to Catholcism. I was only 9 years old and was when I first started thinking about becoming a priest. After a few months my brothers and I were baptized and received into the Church. Our parents followed us into the Church a few months later. Why did you come to the SSPX? By the time I was in High School, I was still thinking about maybe becoming a priest. But at the same time, I was looking for a compromise. That compromise was to become a History Teacher. I was still Novus Ordo, but was displeased with the liberal aspects I saw in the Church. I happened upon a TV special on Fatima and this convinced me that I should pray the Rosary. I was probably about 15 years old. But for the most part I suppressed the thought of becoming a priest. After my high school graduation I was going to college. One morning in the Kansas City Times newspaper, there was an article about SSPX, St. Vincent’s and St. Mary’s Academy and College. I decided that I would go to one of these Masses and see it for myself. The first time I attended Mass with the SSPX was January 7, 1990. That was it. I was a Trad from that day forward. I started reading the books by the Archbishop and by Michael Davies. I also started thinking about becoming a priest again. That fall I transferred to St. Mary’s College. Shortly after, I entered Winona. A fond memory of your seminary time? There are so many! I especially liked Acts of the Magisterium with Bishop Williamson. There he was in his element. The ceremonies were always as solemn as possible and very beautiful. I was a sacristan and so getting ready for the big ceremonies like Corpus Christi and ordinations stick fine in my memory. And who could forget are trip to Rome and other European cities in 1995 (72 days if I recall correctly). An anecdote of your priestly life? I have been blessed to have always been placed in an apostolate were there was a school. Dickinson (4 years), Browerville-Long Prairie (3 years), St. Michaels School in England (3 years), Wanganui, New Zealand (2 years), St. Louis (5 years), Dickinson (3 years and counting). So I still became a teacher. What would you say to a young man today? 25 years, what are your regrets looking back? What are your prayers, looking forward? I pray for perseverance of course. I have now witnessed marriages for those I gave first Holy Communion. I have had a teacher teaching for me that was once my student. Soon there will be someone I once baptized that will seek marriage. I have also seen children grow up to become priests and religious. Others grew up and now I teach their children. It goes by very fast. My prayer is for the SSPX to continue to grow and that our school apostolates continue to produce the fruit that it does. Having chosen to prepare for the Seminary in 1993 two years before entering, I knelt at my bedside and complained to God that I was unworthy and incapable of becoming a priest. An overwhelming thought came to mind: Souls are going to hell; you can help souls. I was determined to enter regardless of weaknesses. My parents after converting to Catholicism immediately started attending Latin Masses. 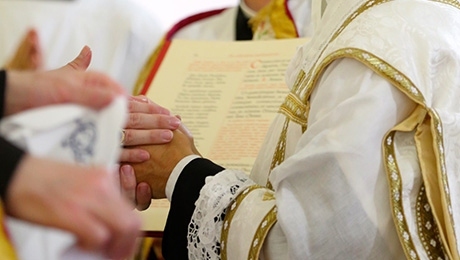 My two brothers and I were baptized by an SSPX priest - Fr. Terence Finnigan in the Seattle area - in 1980. My father was confirmed by Archbishop Lefebvre. Although we attended the Masses of independent priests, we always returned to SSPX Latin Mass in Post Falls, ID. Immaculate Conception Parish was my home parish from 1989 onwards. I have many fond memories of my Seminary life and years. A particular event of fond memory was helping Brother Gerard Nichols after he cut multiple red peppers with his bare hands! I found him in the kitchen suffering from flaming red hands which would not stop burning! We tried a few solutions and finally hit upon soaking his hands in milk. I even called the emergency room. They agreed that milk might be best. With a little relief he headed to bed. He told me he finally fell to sleep at 2am! Living in the country does not automatically save souls. I lived in the country. I see other Catholics living in the country. No matter where people live they must live their Faith and stay close to the Sacraments and Catholic Schools. There is no utopia free from the wounds of Original Sin! Even in the cities souls can be virtuous! What is the best thing you can do with your life? Be a priest! To give Jesus to souls in, through and by the Blessed Sacrament! What is the worst thing you can do with your life? Not to ask a priest's opinion of your future or to try the Seminary or the Religious Life! 15 years, what are your regrets looking back? After fifteen years of priesthood and twelve of these as prior of a community, I regret not being able to do more for my fellow priests in my charge. My poor lieutenants! To be the priest that I should be in this modern age of men, as determined within the mind of God.